I thought it was today, but I just realized it is actually next Saturday. Bummer! The last couple years I forgot about it until it was too late; this year I was too early. How very funny. At least I was finally able to participate in a small way! 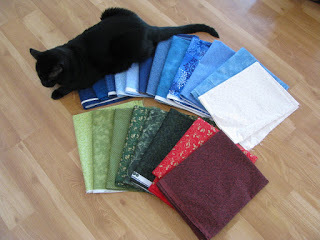 A few years ago, someone sent me a box with quilt blocks, batting, and enough fabric for backing. I just needed to assemble the top and then quilt and baste it. Still a lot of work, but at least the blocks were already complete. The box has been sitting in my closet for awhile but I’ve been pulling it out recently. For this season in my life, a quilt kit is exactly what I need. 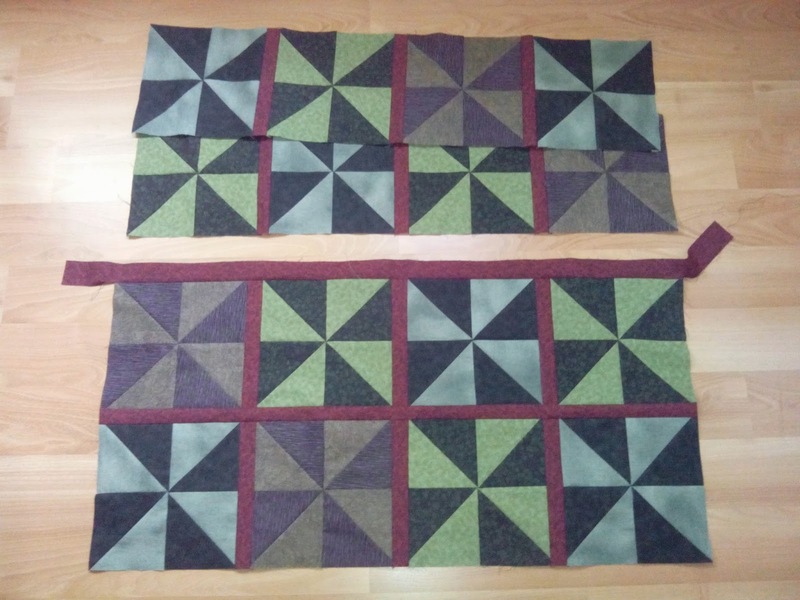 Today I sewed the second row of blocks together. It’s finally starting to look like a quilt top! Jeff is taking certification exams every morning this week. He’s out of the house for about two hours each day so I am planning to use that time to work on my monkey quilt. I didn’t use that entire time this morning to quilt, but I did make some progress. 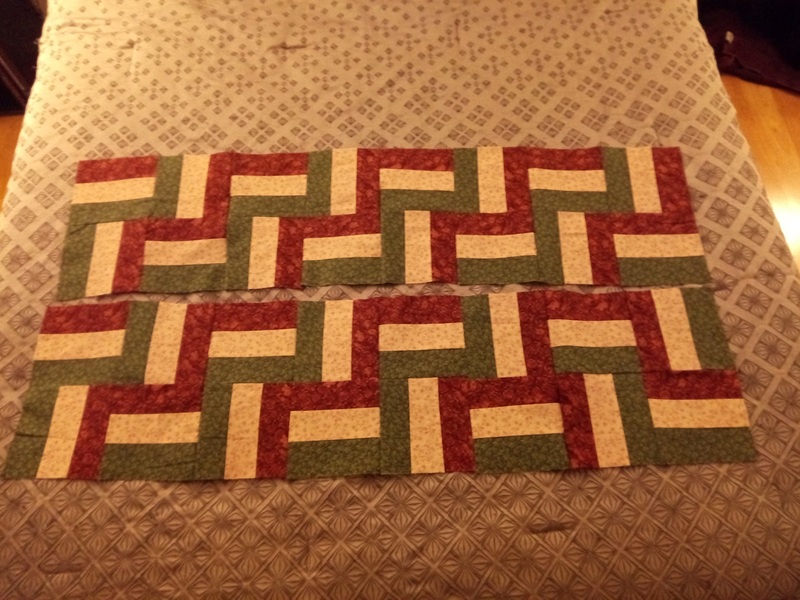 I added two strips of binding this morning and plan to add the other two tomorrow. Then I can add the borders! I’m excited to be making progress, no matter how small. 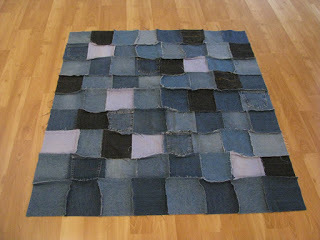 I have not touched my quilting in several months. 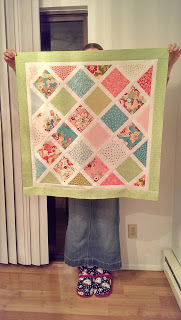 Earlier this year I was on a roll when I pieced an entire quilt top in several days. But then I got sick and have not touched it since. Melissa at Sew BitterSweet Designs is hosting a challenge to finish something in the month of June. 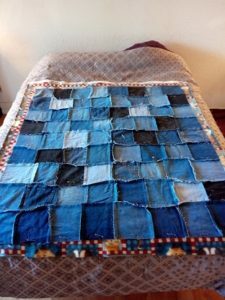 I want to return to the quilt that I am making for my nephew. 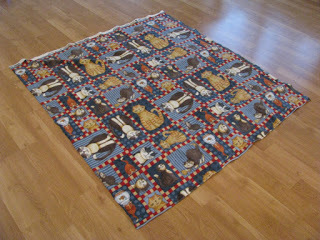 The top is almost complete and I plan to have the quilt completed and shipped to my nephew by June 30. I’m so proud of this one! 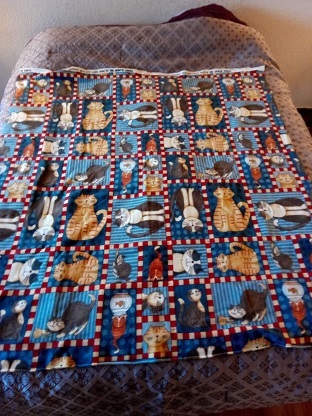 I hope to baste it tomorrow and get started on the quilting. I’d like to have it completed by Sabbath so that I can take it to church and pass it along to the new baby! This year I didn’t really make any new years resolutions, other than to finish up the myriad of half completed projects laying around my house. Today I made an inventory of every project that has been started but is incomplete. This list will keep me busy for awhile! I write blog posts in my head and then forget to post them. By the time I remember, it’s too late in the day for me to sit down at the computer to write… Silly me! I’m making progress on my monkey quilt. I’m so excited to see this one coming together! I still have to sew the blocks into rows and then add the sashing between the rows. I love this quilt! 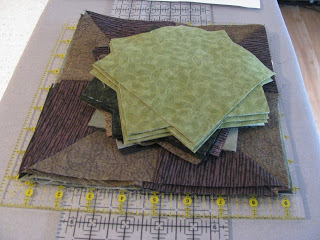 I ended the day with a stack of fabric squares to sew together. 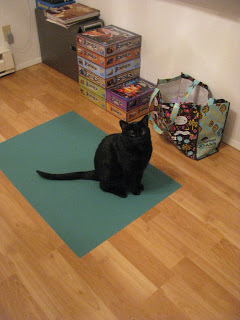 When I asked Bruno to come sit on my newly sewn squares, he promptly plopped down on my cutting mat. Sure, cat, you ignore my fabric the one time I want your help to show off how long this chain is! 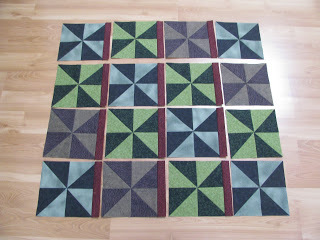 Tomorrow I cut these squares down the diagonal and press them open to form two half square triangles. Then comes tons of ironing and a lot more pinning! Kat has been discussing goals recently and how important it is to create specific goals rather than general New Years resolutions. My second 2013 resolution is to become more intentional, to spend my time more productively. I thought it would prove useful to write up specific goals and completion dates for several of the most important areas of my life. 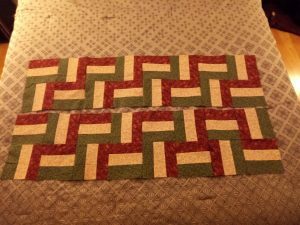 Abstract Goal – To improve my quilting skills. Participate in the 350 Blocks Project. I have no intention of completing 350 blocks as that is way more than I have completed in the past three years total! But I am going to use the project as an opportunity to push myself to finish more (ongoing). Complete four quilts this year. I am currently working on two, a personal lap-sized quilt (March 31) and a baby quilt (Feb 28) for my husband’s college friends’ baby. 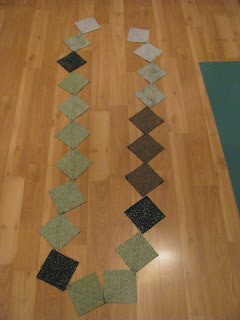 I also want to start and finish a quilt for my new nephew (April 30). Abstract Goal – To become fluent. 30 minutes of study time each and every day (ongoing). Find a language exchange pen pal and write an email once per week (Jan 31). Abstract Goal – To lose weight. Incorporate more fresh food in my diet by including at least one fruit or vegetable at every meal (start by Jan 31). Start eating raw breakfasts at least three times each week (start by Jan 31). Run at least three times per week and train to race a 10k by the end of the year (ongoing). Abstract Goal – To become a better homemaker. Finish organizing my recipe book so that I actually utilize it (March 31). Try at least two new healthy recipes per week (ongoing). 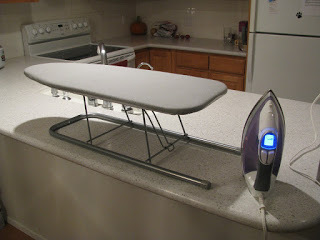 Create and follow my daily chores list (Feb 15). Of course, this does not cover all areas of my life. While I appreciate the challenge of tackling each of these goals, I am a bit overwhelmed by the number of changes it will require. This is why I will have to prioritize and revisit these goals often to make changes based on what is or is not working. I know that January is almost over but there is no better time than now to refocus! I’ve been wanting to link up to WIP Wednesday for awhile! It was only recently that I purchased an iron and an ironing board and was thus able to return to my quilting. 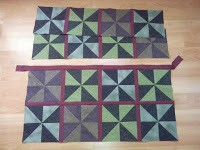 I’ve been alternating between knitting and quilting, enjoying my time with both. 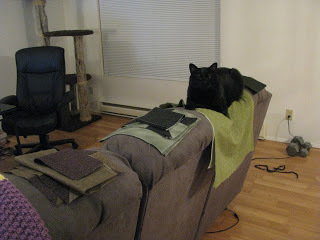 Quilting takes place when I have a large chunk of time availiable and knitting is done while watching tv. Last night I finished this denim quilt top and now need to add the flannel backing. I’m also starting a Christmas project. I am so happy to have an entire pile of fabric! Everything is washed, ironed, and ready to go.